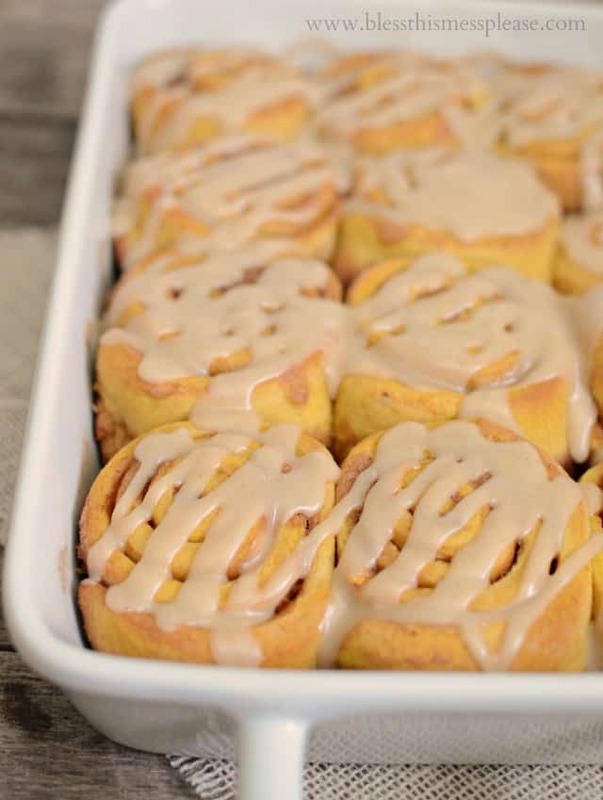 One hour pumpkin cinnamon rolls are just the recipe that we need to kick October off with a bang, am I right!? 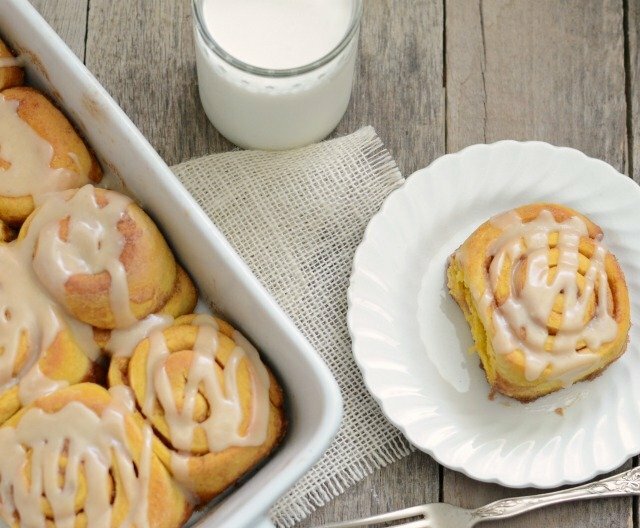 The best part about this recipe is not only that they take just one hour from start to eating, but that it makes 12 perfectly sized cinnamon rolls. Now, do I love recipes that make 4 dozen rolls to call my own, but I don’t really need that many hanging around the house; twelve is much more manageable. These are soft, sweet, and tender with just the right amount of pumpkin pie spice and cinnamon to make them so delicious. I have all kinds of pumpkin delight coming this month, so be excited. 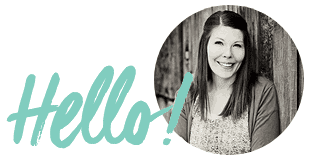 I also have my ebook completely finished, designed, and edited and it is so fabulous. 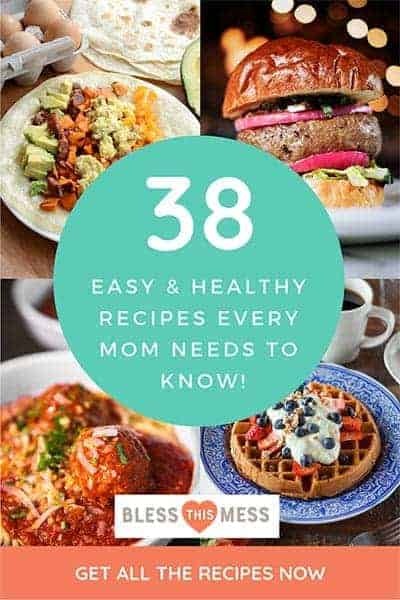 Years of dreaming and months of work have come together to end in over 50 pages of beautiful recipes and thoughts on feeding a family well. I have to figure out how to distribute it, but once that happens I’ll be ready to send it your way. Thanks you so much for all of your love and support. You really are the best readers around. Enjoy these rolls from my kitchen to yours! 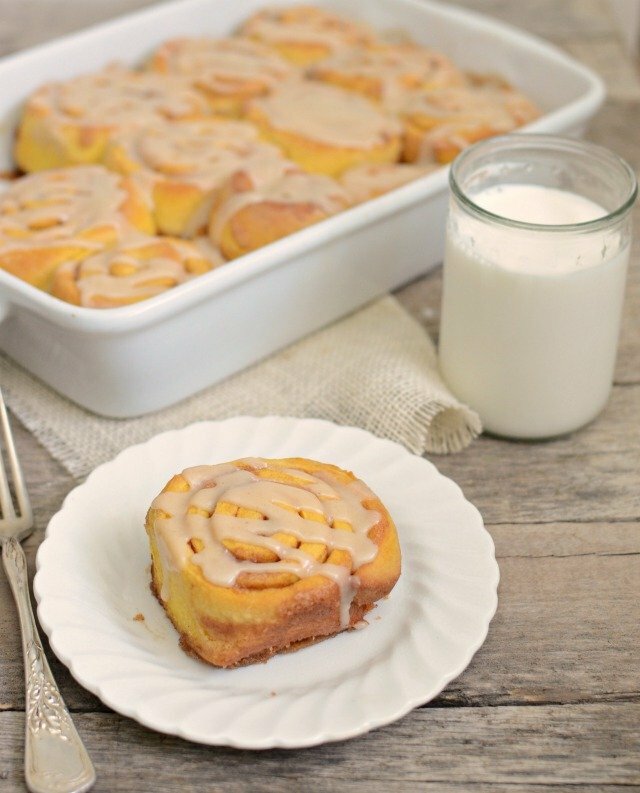 In a large bowl or the bowl of your stand mixer add the milk, butter, sugar, and yeast. Stir to combine and let the mixture sit for 1 minute. Add the pumpkin and the egg and mix until well combined. Add the salt, baking powder, baking soda, and 2 cups of flour. Mix well for 3 minutes. Add the additional flour, 1/2 cup at a time, mixing well between each addition until the dough starts to pull away from the sides of the bowl. Turn the dough out onto a well floured surface and kneed until smooth and elastic, and not sticky, adding flour as needed. Return the dough to the bowl, cover the bowl, and let it rest for 15 minutes. When the dough has finished resting roll it out into a large rectangle, about 16 inches by 24 inches. Spread the filling all over dough. Roll the dough, jelly roll style, starting on the side that is shorter than the other, until you have rolled it all the way up. Cut the dough into 12 rolls (about 1 1/2 inches wide) and place the cut rolls in a well buttered baking dish. Cover the dish and let the rolls rest for 15 minutes. While the rolls are resting, preheat the oven to 375 degrees. After the rolls are done resting baking them in the hot oven until golden brown, around 15-20 minutes (mine were perfect at 18 minutes). Remove from the oven. While they are baking make the icing. To make the icing stir together the powdered sugar, salt, and pumpkin pie spice. Add the melted butter, 1 tablespoon of cream, and the vanilla. Whisk until smooth. Add an additional tablespoon of cream if needed, depending on the consistency you like. Spread the icing all over the rolls and enjoy them warm. One hour of work never tasted so good. oh my these look yummy! and congratulations on the ebook, I can’t wait to see it! These are definitely getting pinned for General Conference next April! The main reason I only make these twice a year is because of the time commitment…but I guess I could spare an hour more often. 🙂 Thanks, Melissa! My mom makes a pumpkin mixture each year to make pumpkin rolls and her pie, do you think that would work ok instead of canned pumpkin? If it’s just homemade cooked pumpkin then yes! I can my own too from pumpkins that I grow in the garden! It’s a glorious color. These were perfect to take to my daughter’s 1st grade Halloween party. There’s an egg allergy in the class so my usual cinnamon roll recipe was out of the question. These were quick, easy and everyone loved them! Plus the kids thought they were extra cool since they were orange for Halloween! Thanks so much! We had these for General Conference brunch on Sunday and loved them! Might need to make 2 pans next time 🙂 Love your happy little corner on the web, I really think we’d be great friends in person! Long live the double batch! Happy General Conferencing to you friend!